Ira writes about the greenhouse effect and how greenhouse gases absorb long wave radiation reflected up from the surface, and emit it again in all directions. Greenhouse gases have increased - a lot. CO2 has increased by 40%, which is warming the earth. I didn't see Ira mention this, but in a warmer earth more water evaporates so there's more water vapour, which is also a greenhouse gas. A double whammy. You can read more about the greenhouse effect in this BoM brochure. Ira puts up a flawed chart based on one prepared by John Christy. It's not a chart of surface temperatures. 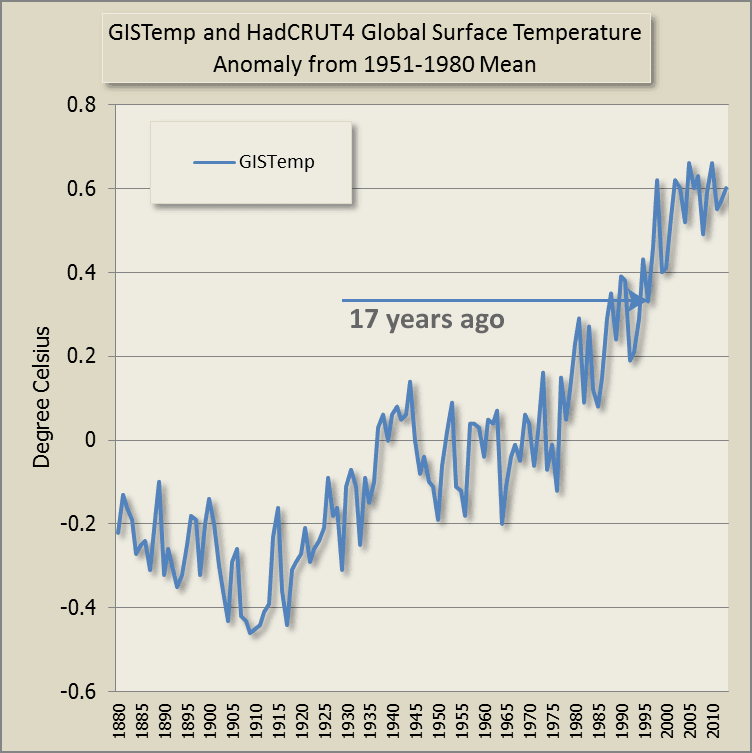 It's not a chart of global surface temperatures. It's a mixed up chart of mid-troposphere temperatures in the tropics. Within a narrow latitude way above the surface in the troposphere, taken from different sources and superimposed with CO2 increase using different scales. It might look impressive to people who know nothing about science and who've never presented data in chart form, but it's completely meaningless. It's reminiscent of the potty peer Christopher Monckton. Here is Ira's messy chart with lots of big letters telling his readers what to think. Compare that with the following animation of global surface temperatures. The data presented here is not just the tropics, nor is it temperature half way up the troposphere. It shows the temperature anomaly at the land and sea surface - and over the entire surface. Like Ira, I've also added the CO2 trend. Unlike Ira, I've gone back to 1959 - as far as there is a consistent instrumental record of CO2 at Mauna Loa. I've presented exactly the same data in all three charts and only varied the vertical axes. Nincompoop version - the temperature is scaled min to max but CO2 has the vertical axes scaled to make it look as if it's not rising as quickly as temperature. Denier version - the CO2 is scaled min to max but the temperature has the vertical axes scaled to make it look as if CO2 is rising much faster than temperature. You can see how the denier version fiddles with the vertical axes until they can get it to look as if CO2 is rising much faster than temperature. It's an optical illusion. In fact I would argue all the above are all an illusion of sorts. You can't tell an awful lot just from eyeballing CO2 and temperatures on the same chart because they are measuring different things, which have different units (degrees vs ppm). If anything though, scaling both to the min max better illustrates the relationship. The IPCC claims that Climate Sensitivity (the average increase in Surface temperatures due to a doubling of CO2) is between 3°F and 8°F (1.5°C and 4.5°C). Some skeptics (including me) believe they are off by at least a factor of two, and possibly a factor of three, and that Climate Sensitivity is closer to 1°F to 3°F (0.5°C to 1.5°C). As evidence for our conclusions, we point to the fact that virtually ALL of the IPCC climate models have consistently over-estimated future temperature predictions as compared to the actual temperature record. Indeed, for the past 17 years as CO2 levels continue their rapid climb, temperatures have leveled off, which is proof that Natural Cycles, not under human control or influence, have cancelled out warming due to CO2 increases. Thus, Natural Cycles must have a larger effect than CO2. That's nuts. How does Ira know that future temperatures are over-estimated? The future hasn't happened yet. There are no "actual" temperature records of the future. If Ira is hanging his hat on the fact that observations are at the low end of the models now, then he's got things back to front. The natural cycles haven't "cancelled out" any warming. What's happened is that the deeper oceans have been joining in the warming. Ira will be very disappointed. Ira is putting all emphasis on the latest denier meme, quoting "for the past 17 years". Let's look at what's happened in the "past 17 years". Seventeen years ago is 1996 - you can see more evidence of how the world has warmed since 1996 here. You may have noticed that Ira doesn't explain how, when temperatures have already risen by 0.8 degrees with only a 40% increase in CO2, climate sensitivity (a doubling of CO2) could lead to a rise of only 0.5 degrees. Even if 0.3 degrees were attributed to more incoming solar radiation (which is not that high at present), there's still another 60% increase in CO2 to go (another 170 ppm or so) before we get to a doubling of CO2. Ira is saying he accepts the science to a point before his denial takes over. He doesn't want to "believe" that the earth will warm a lot as long as we keep adding more and more CO2 to the atmosphere. He's a great risk taker. A foolish risk taker. And he is trying to deceive people with his personal speculation that "scientists don't know nuffin'". If you thought WUWT deniers were moving toward the science, think again. All the greenhouse effect deniers popped out of the WUWT woodwork in response to Ira's article. You are assuming that some of the “warming” is due to humans/ Well as a scientist with 4 higher degrees in statistics I am assuming that you are 100% wrong you do not have the faintest clue whether it is or not/ Sorry I am now a 100% denialist and proud of it. I think time will vindicate me. What a load of blx! Just 1% of which 96% is natural is a determining factor bit it doesnt stop ice ages and if believed to be true temp rises before co2. The truth is no one has a clue and even if they did they couldnt do anything about it, one side of the argument is corrupt as the other the only difference is that Al Gore and his mates have made millions and the other side have not, who dares wins! ...What can be said is that to date there is no evidence for discernible global warming from human activities so any human contribution to observed global warming is trivial if it exists. In two places, the author as claimed as fact that mankind’s unprecedented burning of fossil fuels is responsible for the majority of the increase in atmospheric CO2 (” Most of the increase in Atmospheric CO2 (a 40% rise from about 270 to nearly 400 parts per million by volume) is due to human activities.”). This assertion is unproven, and as far as I know, largely unexplored. We know that there are a number of undersea volcanos which spew incredible amounts of CO2 into the seas, but how much? How many volcanos? How long for any of that CO2 to reach the atmosphere? Plus, how much atmospheric CO2 is due release from other sinks due to post LIA warming? People who are looking for “warming” due to the greenhouse effect are barking up the wrong tree. The greenhouse effect slows the rate of cooling. As calculated by Lord Kelvin over a century ago the earth should be frozen. It is not because of radioactive energy in the core. The greenhouse effect slows the rate of energy loss. Gregory says of the title: "Global Warming is REAL but NOT a Big DEAL"
Not a helpful title, Ira. "as a scientist with 4 higher degrees in statistics"
Is that possible? A bachelor, a master, a doctor and a ??? in statistics. Her poor grammar and usage - in addition to her use of fallacious logic - argue against her having ever darkened the doorways of a tertiary institution. That'd be right - criticise someone's language skills and sign off with a typo! In Europe two masters or two doctorates in the same field would be impossible. I think it would not even be allowed to have two doctorates in two different fields in a natural science. There are some people with multiple doctorates, but they have them in very different fields: science, medicine, humanities. Time before that, when he testified before Congress, Christy hawked the Watts et al draft paper put out the weekend of the BEST results. That paper STILL hasn't come out, nor has Christy corrected his testimony, as far as I know. I feel sorry for the members of the Philosophy Club at IRA's retirement village who sat and/or slept through his presentation. More peer-reviewed gold from Tony's blog! As an aside - if you scale any two variables min to max will they not give the appearance of correlaton? I agree pretty much. The chart will show if they are travelling in the same direction or different directions (ie positive or negative correlation over time or none). It says nothing about whether there is any causal relationship. You'd have to go to the physics for that. The main point I was wanting to make was how easy it is to create an illusion of whatever point a person wants to make. It wouldn't fool anyone who is used to charting or working with numerical data in general, but it's enough to fool the average science denier and maybe even ordinary people. This is an eternal problem at WUWT. They love to say "correlation does not equal causation" but all the posters bar Willis don't actually understand how to calculate correlation, let alone autocorrelation, which is what is needed to infer a relationship between two time series. Willis knows what autocorrelation is but then calculates it incorrectly, conveniently enabling him to claim trends are non-significant when they are actually significant. "the only difference is that Al Gore and his mates have made millions and the other side", e.g., Exxon Mobil, made about $110 million. Yesterday. After taxes. And did the same every single day for the last year. Throw in Saudi-Aramco, Gazprom, National .Iranian(all larger than ExxonMobil), PetroChina, BP, Royal Dutch Shell, and another dozen bit payers like Pemex, Chevron, & Kuwait - you're starting to talk real money. First two images not appearing here - Firefox 26.0. I have tried the suggested fixes without success. Same thing with an animated GIF in another article here. works fine for me (Firefox 26.0 here too). Also no problem for me. Maybe your ad blocker is the problem? First thing I tried, along with some other Firefox support suggestions to no avail. I have checked through Kapsersky settings too. I note the issue is with gif images although gifs on my own site pages work fine as they do on other sites. Never mind, not life threatening. I'm sorry, Lionel. For static images I try to stick to png files. For animations I'm stuck with gif files. Blogger is run by Google and I don't have a lot of flexibility - unless I change the template, which I'm not inclined to do. If anyone else has the same problem can you let me know and I'll see if I can figure out what's causing it. I can't test it myself because I'm unable to replicate it in any browser. "As calculated by Lord Kelvin over a century ago the earth should be frozen. It is not because of radioactive energy in the core. The greenhouse effect slows the rate of energy loss." This is spectacular. It's as if the poster has only ever learned one fact about physics and extrapolates everything else from that fact. Given the number of times deniers tell us, "it's the Sun," I think this statement really deserves its winning status for sheer cluelessness.